A likable, upbeat boy who tends to jump into things without consulting anybody else-sometimes with disastrous results. He seems to be hung up on other people remembering him, and taught Ventus the importance of making friends. He and his own best friend, Isa, have bigger plans. The human form of Axel, one of Organization XIII's Nobodies. He has awoken in Radiant Garden. A friendly and childish boy. He seems to be planning something with his friend Isa. A Keyblade wielder who was once a Nobody and member of Organization XIII, at which time he went by the name "Axel." After regaining his humanity, Lea joined forces with Sora and the other guardians of light. Through difficult training, he learned to summon and wield a Keyblade. "I want everybody I meet to remember me. Inside people's memories, I can live forever." Lea is the human form of Axel. 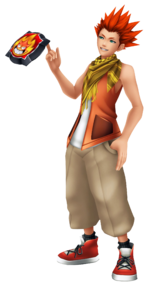 In Kingdom Hearts Birth by Sleep, he appears as a teenager and a close friend of Isa. He appears as an adult in Kingdom Hearts 3D: Dream Drop Distance, in which he chooses to become a Keyblade wielder under Master Yen Sid. Lea loses a sparing match against Ventus. Lea lives an idyllic life alongside his best friend Isa on the world of Radiant Garden, and conspires with Isa to break into Ansem the Wise's castle for the sake of mischief. The pair walks past the town square shortly after Terra and Aqua have left Radiant Garden, where Lea notices Ventus drop his Wooden Keyblade and hands it back to him, as Isa impatiently watches. Lea teases Ventus for using a "kid" weapon, and proudly shows off his frisbees while challenging Ventus to a sparring match. Ventus readily accepts, to Isa's amusement, and easily defeats Lea. Though Lea tries to claim the match is a draw, Isa chides him and the three leave to part ways, laughing. Lea vows to Ventus that they will meet again, as they are now friends, a comfort that prompts Ventus to decide to keep making friends. As they walk away, Isa asks Lea why he keeps befriending strangers, and Lea answers that he wants to live forever in the memories of everyone he meets. As they near the castle, the pair look up to it and Lea checks if Isa is ready to begin. Sometime after Terra-Xehanort is defeated and taken in by Ansem, Dilan throws a struggling Lea and a resigned Isa out of the castle as Aeleus looks on. Afterward, the pair go to the Castle Town to buy sea-salt ice cream from Scrooge McDuck, and they look up to the sky as they eat. From thereon, sea-salt becomes Lea's favorite ice cream flavor. Lea and Isa regularly snuck into Ansem the Wise's castle to visit a girl they met there. At some point during Sora's journey, he destroys Lea's Heartless. Lea awakens in Ansem's lab. Lea has a dream of Roxas reminding Axel of the promise he made to him and Xion, to always be there to bring them back, and he awakens, with his memories of his time as Axel intact. Discovering that four of the founding members of Organization XIII, Aeleus, Even, Dilan and Ienzo, have been recompleted as well, Lea notices that Braig and Isa are missing and decides to look for them. After talking with Aeleus in Ansem the Wise's study, he finds out there is no one else in the Castle. Deciding to check the castle grounds, Lea is told by Aeleus not to bother. Ienzo explains to Lea if Braig and Isa were recompleted, they would have appeared in the same place as the others. This makes Lea wonder if Braig and Isa could have been "blasted off to some other world", which Ienzo explains is possible if the world they came from no longer exists when they are reborn; they'd reappear in Traverse Town or a similar place if that was the case. Lea then finds the remnants of Ansem's notes about the Door to Darkness, and leaves to bring back Braig and Isa, without telling Ienzo and Aeleus how, complaining that he always gets stuck with the icky jobs. Lea uses a Corridor of Darkness to travel to Disney Castle, hoping King Mickey would help him in his search. From inside the Corridor, he disrupts the hostage situation taking place in the library, blocking Maleficent's attack against Mickey, Donald, and Goofy and distracting Pete long enough for Queen Minnie to escape his clutches. Once Maleficent and Pete are gone, Lea reveals and introduces himself to Mickey and his friends. Revealing his motives, Lea asks for their help in his search. Lea travels to the Mysterious Tower with Mickey, Donald, and Goofy, being brought up to speed regarding Sora and Riku's Mark of Mastery exam and Xehanort's inevitable return. Seeing they need more help, Lea requests that Yen Sid make him a Keyblade wielder, shocking everyone present. Yen Sid warns him that the road he has chosen will not be easy, but Lea decides to "jump right in" anyway. He is then helped with his training by Merlin, along with Flora, Fauna, and Merryweather, by using their magic to compress the time his training would take. Lea challenges the newly revived Master Xehanort. Learning of the danger everyone else is in, Lea arrives in The World That Never Was, just in time to save Sora from becoming Master Xehanort's final vessel in the new Organization XIII. His appearance shocks Xemnas and Xigbar, the latter of whom calls him "Axel". Lea explains that when he was Axel, he promised Roxas he would always be there to bring back his friends and intends to make good on it, then jokes to Master Xehanort that he had plotted his "script" so well, but forgot to "write the sequel". Lea is attacked by a hooded member wielding the Lunatic. After deflecting the attack, the member's hood blows back to reveal Saïx, leaving Lea shocked to see his former friend as one of Master Xehanort's vessels. Regrouping with Mickey and Riku, Lea gives up on correcting people about his name and says they should escape while they have the chance. After Donald and Goofy arrive and defeat Xehanort's guardian, the new Organization begins disappearing, its members returning to their proper place in time. As they leave, Lea shares a final look with Saïx. Lea summons his Keyblade for the first time. Back in the Mysterious Tower, Riku decides to go back into Sora's dream to awaken him. Lea tells Riku if the darkness gets him again, then he will be there to get him out, joking that "Dark Rescue" is his middle name. After Riku succeeds in awakening Sora, Lea then joins him and the others in a tea party while Riku is recovering. Once Riku wakes up and Yen Sid declares him a Keyblade Master, Lea tells Riku that he'll catch up to him in no time and become a Keyblade Master as well. Despite Sora and Riku's disbelief, he explains that he came to the Mysterious Tower to learn how to wield a Keyblade and even planned to be using one when he showed up to save Sora and Riku, but hasn't been able to summon it yet. Wondering if the problem is in the way he moves his wrist, Lea tries one more time and successfully summons his Keyblade, Flame Liberator, shocking everyone present. Afterwards, Lea soon returns to Radiant Garden. Yen Sid mentions that Lea is undergoing further training with both Merlin and the three fairies. When Kairi wonders who Lea is, Mickey explains to her that Lea was once Axel, much to her shock, but clarifies that he is now on their side. "Do you know how popular I am? I got lots of people rootin' for me. Sorry boss, no one axes Axel. Got it memorized?" While Sora and company set on their respective quests in preparation for the second Keyblade War, Lea and Kairi continue their training in the Secret Forest. When he catches Kairi writing a letter to Sora, she admits it is more for herself. Lea then presents Kairi with some sea-salt ice cream to celebrate them both summoning Keyblades. Kairi catches Lea staring and inquires if he is trying to remember something, to which he confirms. As Kairi gets excited to duel in the ring, telling Lea to promise not to hold back, it stirs memories of Xion in Lea's heart. Kairi asks him to stop apologizing, and he agrees on the condition she calls him "Axel". Lea and Kairi prepare for the journey ahead as their training comes to an end. Some time later, Lea is watching the horizon when Kairi greets him, revealing her new clothes and haircut. Kairi confides in Lea about her desire to free Naminé, a sentiment he shares in regards to Roxas. He proceeds to tell her about a young boy he met when he was younger whom he became fast friends with, but disappeared. He confesses he nearly forgot about him until Roxas showed up and he saw they were identical, though he never told Roxas out of fear he would also vanish. Concerned that Ventus has forgotten him, Kairi assures him that Ventus does remember him. Back at Master Yen Sid's Tower, Lea attempts to standout and make sense of the events surrounding his allies' connections with each other, though the others seemingly ignore him. When Lea asks where he fits in, pointing out that Ventus and Roxas are identical, Ventus takes notice of Lea and addresses him, surprising the latter and revealing their friendship to Sora and the others. As the group decides their next course of action to save the missing members, Lea pledges to get Roxas back. At the Twilight Town Clock Tower, Lea and Saïx discuss what happened to the girl they befriended at Radiant Garden. Later, Lea sits on the clock tower in Twilight Town, eating sea-salt ice cream while holding two others. He expresses regret he has been unable to rescue Roxas yet just as Saïx appears to speak with him. When Saïx asks why Lea bought three sea-salt ice cream bars, Lea is unable to answer him. The two then proceed to recount how they became apprentices under Ansem the Wise in Radiant Garden to rescue a girl they befriended in the castle before her disappearance. Saïx accuses Lea for giving up their original goal, though Lea argues that he didn't, as he helped Saïx climb the Organization's ranks to get closer to Xemnas to find out what happened to their friend. Although Saïx believes that their friend is gone forever, Lea declares he will get all their friends back, including dragging Saïx back home. Saïx points out Lea's upside-down tear marks, which stopped him from crying, are gone and Lea scoffs he no longer needs them. Lea vows to beat Saïx in the final battle before the latter disappears. The next day, Lea and the other guardians of light travel to the Keyblade Graveyard. After fighting thousands of Heartless, the group is attacked and overpowered by Terra-Xehanort. When Terra-Xehanort goes to attack Kairi, Lea throws himself between them and is rendered unconscious while Kairi and Riku try to tend to him. A Demon Tide is unleashed and it swallows the group. After Sora manages to rescue everyone's hearts using the power of waking, they return to the Keyblade Graveyard. When they are surrounded by a swarm of Heartless once more, Master Yen Sid appears and opens a path so they can progress to fight Xehanort's chosen thirteen. Lea and Kairi pair up to fight Saïx and a hooded figure wielding a Keyblade. Sora soon joins in but Saïx overpowers them. As Saïx goes to finish Sora and Kairi, Lea defends them, demanding Isa to stop but is pushed back. Then Xemnas appears and condemns Lea for becoming a traitor when he used to be the one sent to deal with traitors. As he prepares to dispatch Lea, the hooded figure stops him, claiming they need Lea alive. Xemnas clarifies they only need his heart before ordering her to kill Lea, as they were former friends. Bewildered and injured, Lea asks who the hooded figure is, who prepares to strike him down. Sora intervenes, pleading with and reassuring the figure whom he calls "Xion", who is then overwhelmed. Xemnas kicks her, revealing her face as her hood falls, triggering Lea's memories of Xion. As Xemnas prepares to destroy Xion, Lea attempts to stop Xemnas, but is helpless to stop him. A heart escapes Sora and Roxas reappears, using a replica as his vessel, and saves his friends, much to Lea's joy. Lea cries and embraces Roxas and Xion as they are finally reunited. Xemnas kidnaps Kairi and leaves the group to fight the berserk Saïx. Lea, given his injuries, is forced to stand back, with Roxas and Xion aiding Sora in his place and Kairi's. When the battle concludes, Lea rushes over to Saïx who asks why he looks so sad and that he thought Lea outgrew the marks under his eyes as it looks like he needs them. Lea expresses disgust at what Saïx let the Organization reduce him to and says he thought everything was for their missing friend, which Saïx affirms was true in the beginning as he sacrificed everything to track her down. However, when Lea befriended Roxas and Xion, leaving Saïx and their other friend behind, it enraged Saïx and he lost all sense of purpose. Lea insists he didn't forget them and Saïx agrees Lea wouldn't do that. Saïx admits he was jealous before collapsing in Lea's arms as he begins to fade. Lea and Saïx say they will see each other again and Saïx fades away. Having made amends, Lea tells Sora to go after Kairi before wondering what to do now. Xion promptly begins to cry and while Roxas attempts to comfort her, Lea awkwardly remarks he should have brought some ice cream. The three laugh before embracing and crying, finally reunited. As Sora prepares to go after Master Xehanort, Lea reappears with Roxas and Xion. They join the others in using their Keyblades on Master Xehanort and helping close Kingdom Hearts. After Master Xehanort is defeated, Lea and the others appear alongside Sora, Donald, and Goofy in Scala ad Caelum. After Xehanort and Master Eraqus fade into the light together, Sora uses Lea and the others' light with the χ-blade to purify and close Kingdom Hearts before being transported back to the Keyblade Graveyard. Then Lea and the others watch Sora leave a solo journey to bring back the missing Kairi. The trio sits together on the Clock Tower once more. Shortly after Kairi is recovered, Lea, now wearing his new clothes, sits with Roxas, Xion, and the revived Isa on the clock tower in Twilight Town to share ice cream in celebration. They are joined by Hayner, Pence, and Olette, but Riku shortly arrives in the Highwind. The group is taken to another celebration at Destiny Islands with the other former Guardians of Light, where Lea plays frisbee on the beach with Isa and Ventus. Then they look on as Kairi makes a last contact with Sora's heart, before he fades away. Lea in Kingdom Hearts Birth by Sleep. During his youth in Radiant Garden, Lea looks about the same age as Ventus. His hair resembles his Nobody's, but shorter and with the spikes styled upward. Lea has a slight widow's peak, a trait he also shares with Axel, though Lea's is more noticeable. Lea's eyes are also more of a blue-green color than Axel's striking green. He wears a sleeveless orange jacket with a white, sleeveless shirt underneath, and tan, baggy pants with red and white sneakers and black socks. The pockets of his jacket are a much darker shade of orange than the rest of it. He also wears a yellow and brown keffiyeh around his neck. The pattern of this keffiyeh changes abruptly near Lea's neck, from stripes to a very organized checkerboard pattern. Similar to Braig's scarf, the tip of Lea's keffiyeh is frayed slightly. He bears a curious resemblance to Hayner. Lea at the end of Kingdom Hearts III. 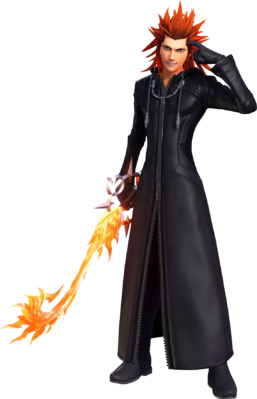 After being revived following Axel's demise, Lea wears the black coat he wore during his time as Axel and appears identical to his former Nobody, only lacking the tear-shaped markings below his eyes, and having a slightly darker skin tone. When Riku gives Kairi and Lea their new clothes from Merlin and the Three Good Fairies, Lea opts not to wear them and continues wearing the black coat. It is after Master Xehanort is defeated that Lea dons his new outfit. He wears a long sleeveless hooded black vest, a sleeveless dark gray and red plaid button-down shirt with a short-sleeve black shirt underneath, and blackish-red pants and black mid-calf boots. As a teenager, Lea is mischievous and childish. He conspires with Isa to sneak into Ansem the Wise's castle and flailing childishly upon being caught and thrown out by Dilan. Lea is smug and sarcastic, as shown he teases Ventus upon meeting him and exhibiting a competitive streak by challenging the latter to a duel. Lea seeks to live forever through the memories of those he meets, and he promises to always be there for his friends. Due to this, Lea often says, "Got it memorized?" as a catchphrase, emphasizing his desire to be remembered by those he meet. Lea values his friendship with Isa, who he considers his best friend. However, after turning into Nobodies, their friendship became strained, with the two friends drifting apart due Isa's personality changing too much after he became Saïx. Day 118: You Changed, Not Me In spite of this, Lea shows concern for Isa and sets out to find him when he notices that Isa is missing after the Organization XIII members are restored as humans in Radiant Garden. Retaining his memories from his time as Axel, Lea continues to treasure his friendship with Roxas as he considers Sora to be a friend since their respective Nobodies were best friends. As an adult, Lea acts as cocky his Nobody counterpart. He retains his competitive streak, demonstrated when he challenges Master Xehanort while defending Sora and states that he intends to compete with Riku in the art of the Keyblade. After his restoration, Lea is often referred to as Axel by Sora and his allies, much to his exasperation, prompting him to correct them. Eventually, Lea relents to being referred to as Axel after Riku addresses him by the wrong name. Ultimately, he decides to just go by Axel as only Saïx and Ven know his real name. Lea cares very deeply for his friends, which Saïx suggests is the reason for the tear-shaped marks he had as Axel. Lea even reveals that as Axel, he had the silly thought that Roxas would disappear like Ven if he ever told him about their identical appearances. Throughout Kingdom Hearts III, Lea becomes very emotional about his past friendship with Isa and cries when he almost remembers Xion. His bond with them drives Lea to fight to protect them even if he's wounded or inadequately armed. As a teenager, Lea is not physically shown fighting, though he has an offscreen spar with Ventus and loses. His weapons during that time consist of two red frisbees with black edges, each adorned with a Bomb design, which later influence the chakrams Axel wields during his time in the Organization. Upon reaching adulthood following his Nobody and Heartless's destruction, Lea wields his Nobody's Eternal Flames chakrams, and after Sora and Riku's Mark of Mastery exam comes to an end, he reveals his ability to wield a Keyblade—the Flame Liberator—that bears features from his chakrams, the Bond of Flame and Frolic Flame Keyblades, having received a magically compressed training session from Yen Sid, Merlin and the three fairies. In Kingdom Hearts III, he fights by holding his Keyblade by its guard similarly to his chakrams, performing combos that spin it in-hand to attack, and while he is fighting Saïx, Lea shows the ability to Formchange his Keyblade into his chakrams at will in a manner similar to a dual Fire Raid attack. In an issue of Famitsu PSP+PS3, Lea's name was misromanized as "Lia". It was also once misspelled on the Kingdom Hearts Birth by Sleep official website, though it was later corrected. Although it was a joke, Lea's statement that he should have been friends with Ventus rather than with Isa foreshadows future events. In the future, his Nobody would choose to become friends with Roxas rather than stay friends with Saïx, Isa's Nobody. ↑ Kingdom Hearts 358/2 Days, Roxas: "Sea-salt is Axel's favorite."